Dom't know if this fits here, but new memo for Waukegan Service on Pacebus.com. Reads like a "don't blame us" statement. Due to track reconstruction, some Northbound Metra UP-North line trains will be delayed arriving at Waukegan Metra station. Bus departure times from Downtown Waukegan will not change due to the significant inconvenience this would cause other passengers. Some customers transferring to buses from Northbound trains may miss connections. Please consult travel notices from Metra. Thank you for your continued support of Pace service. The usual deal is that if Metra messes with the schedule, Pace will adjust its schedule, or on some South feeders has a schedule note that the bus will wait up to 5 minutes for the train. The relevance here seems to be that with all the interlining due to the restructuring, Pace can't do it here. Usually with the case of holiday schedules would the trip times change (i.e. BNSF or UP trains). This is just a delay caused by construction, and as Jack mentioned, those interlines matter (especially heading out towards CLC and Hawthorn). I didn't think this question deserved a new thread so I'm asking it here. 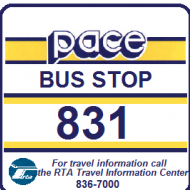 I notice the Pace bus stop signs in Rogers Park do NOT have a sign code so one can text for arrival information. I base this statement on signs for the #290 and #215. Any ideas or did I just miss something? Could be an oversight; I'd recommend bugging Customer Relations and letting them know. I have noticed that PACE river division has a opening for Full time bus operatorhttp://pacebus.com/sub/about/employment_detail.asp?PostingID=756 how come PACE river and Fox valley are the only divisions that have full time openings? Every other division just has part-time openings, why is that? Could be cause they are harder to get to. Maybe their part time applicants (if they have any) transfer garages when they go full time. Maybe especially at River, there are not many runs that can do a hour or two run. Anything running the #600's is at least 4 hrs. They would have to all run out of Elgin Transportation center like the #550's, but even like a #554, that has to run at least 3 hrs for a tripper service. When you think of all the eldorkos out there, the job would seem pretty easy, the 35 and 40 foot bus drivers are earning their pay however. Each Pace garage has its own union contract, unlike CTA. The contracts stipulate FV and River only hire full time employees, whereas the others promote to full time based on seniority. To switch garages, one would have to re-apply at that garage, there are no system picks like CTA has. I never understood why each PACE garage has it's own union? Is this a holdover from the pre-PACE day's? I know that North and North Shore are ATU and Northwest and River are Teamsters. Mostly a holdover. Some of the ATU locals merged into 241, but they would need a union election to merge with the Teamsters. 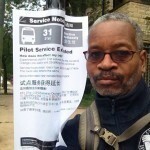 The most incomprehensible one is that before the merger, the ATU local for North Shore was the Evanston Bus Co. one, even though Evanston Bus Co. went out of business about 18 years before North Shore opened and there was no connection between the two. On the other hand West being part of 241 probably goes back to the trolley days. 241 also seems to represent MV workers. Interesting, wonder how that affected Wil-BUS employees, when WIL-Bus was merged into PACE North Shore? Wilbus appears to have been a municipal operation (like Niles and Highland Park), while the North Shore garage was supposed to be part of NORTRAN before it was taken over by Pace. However, what the bottom line seems to be is that generally speaking, and here under the Illinois Public Labor Relations Act the employer is required to bargain with the union recognized as selected by the union (sec. 7)--the employer does not select the union, but the employees hold a recognition election (sec. 9). Although I wasn't there, the regular course would have been that someone from the ATU organized the drivers and the drivers voted to be represented by them. In what local ATU put those members is its own business, but the Teamsters would have had to force a recognition election. Nothing in this Act shall interfere with or negate the current representation rights or patterns and practices of labor organizations which have historically represented public employees for the purpose of collective bargaining, including but not limited to the negotiations of wages, hours and working conditions, discussions of employees' grievances, resolution of jurisdictional disputes, or the establishment and maintenance of prevailing wage rates, unless a majority of employees so represented express a contrary desire pursuant to the procedures set forth in this Act. That probably has some effect on East Dundee being River Division, as those drivers would come under the Teamsters Local 330 contract. But that link indicates that River has PTOs.Why there is a posting only for full time, I don't know. FV only advertises full time, but @trainman8119 said that wasn't 40 hours/week. Very interesting, so if they are not getting 40 hours a week, why did they make them full time? @trainman8119 should have the answer, but basically job classifications are only as defined in the particular collective bargaining agreement. If it says 30 hours, so be it. last part timers hired. When I went from part time to full time, I went from 30 hours to 60 overnight. not enough locals are applying. I am sure that could be the same type of situation in Elgin at River Division. Being satellite divisions, it is difficult to find operators willing to drive distances to work part time and not enough locals are applying. Probably the result of all the I-90 work. If they have to report to East Dundee, that could explain it. Damn when did the north shore restructuring start? I saw a 213 on Chicago Avenue in Evanston with 1 guy on it. I was looking at why would the 205 be running in the same location and it's been discontinued. So is the 54a gone? Or are the edens express buses like 641 in place? Except Evanston refused to change the street names to match the rest of Golf Road. So west of the North Shore Channel, it's Simpson St. on the Evanston side & Golf on the Skokie side. East of the Channel it's Emerson St. & at the east end it's Elgin Road. Now the original name of the street west of Skokie was Evanston-Elgin Road, but Skokie called Simpson when I was a kid in the 50s. There was an effort to get the entire street named Golf, but Evanston, being Evanston refused. The reason the street & the suburb are named Golf is that around 100 years ago, the president of the Milwaukee Road had a siding built next to a golf course for his private car & when anyone at the railroad wanted to know where he was, they said he was at "Golf". If you haven't seen it, you must see the Golf Police Station. It's could be the smallest in this country, as it's just one room at the south end of the Golf train station. I thought phoenix, il was pretty small at 1900 population but your golf community only has 500. The only changes so far are 205 withdrawn and replaced by 208 (E-W part) and 213 (N-S part) with some rush hour changes to 206 to serve Evanston Township High School. The 208, 213 changes took place on Aug 11th, the 205, 206 changes took place on Sep 4th. As this community goes down to Random CTA, this is not the correct topic, and you know that. If you looked at the correct topic, you could find your answer. What #206 changes? #206 is gone? It's kind of weird but as many times as I've drove the edens I never saw a bus on shoulder yet. I think the traffic is pretty good north of Dempster and they don't really need a bus on shoulder. Usually the edens starts getting issues at Touhy sb. The Tri state has consistently bad traffic especially up by O'Hare. How in the heck #895 keeps on schedule I don't know.